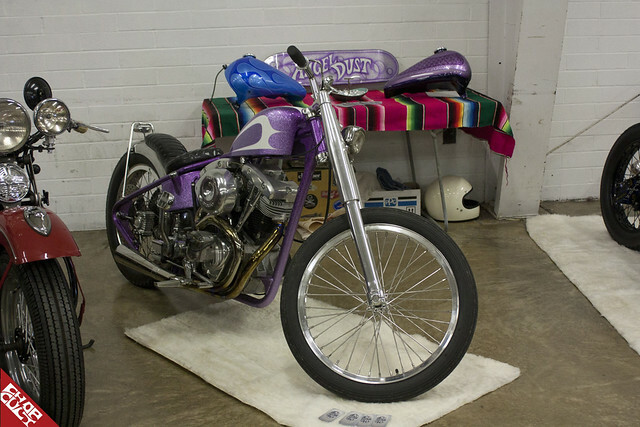 The “swap meet” is a classic motorcycling tradition. It’s rad that many torches are being passed and leaders like our friends at Lowbrow Customs are stepping up to bring this type of event to the next generation. I recently attended the Midwest Moto Swap, November edition, and I was not disappointed! It was a great pleasure on three fronts: as a spectator, a vendor and to cover it as a journalist. The Moto Swap made for a full day of entertainment and I even went home with some booty. I picked up a few parts, a pair of nearly new vintage boots, and peddle bike from the 40’s. That said, the Swap is heavily focused on hard parts and the thing I liked most was the quality of the offerings. 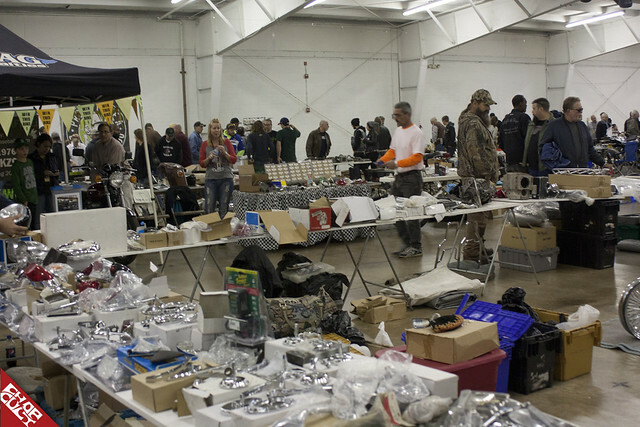 The entire hall was completely devoid of do‐rags, tribal junk and cheap leathers that seem to overtake far too many so-called “swap meets”. It was also a good opportunity to connect with friends from around the Midwest and say”hi” to the Lowbrow team. I had recently torn up my shoulder in a crash so when we arrived with our truck full of parts, Kyle (VP at Lowbrow Customs) in true brotherly fashion pitched in to help us unload. I mention that only to illustrate the type of event this is; it’s got a real “let’s work together and grow this culture” kind of vibe. Everyone is very friendly and helpful and tough guy attitudes are unwelcome. It’s a great way to spend the afternoon, even with toddlers in tow; cheap eats, good music, and good times with a chance to find your next treasure or wall hanger. 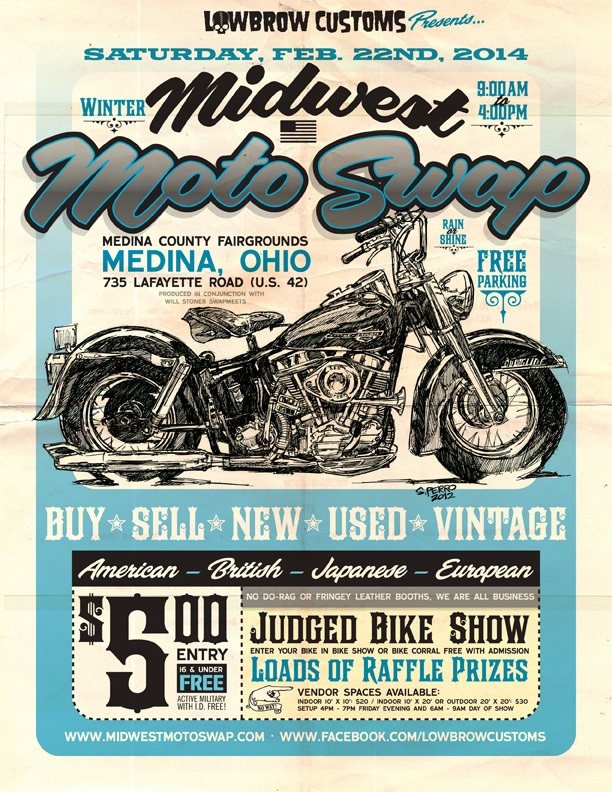 I’m adding the Midwest Moto Swap to my calendar on the regular and will be attending the next one in February. Whether you’re a spectator or vendor it’s totally worth the trip. Tyler, Kyle, and the Lowbrow crew run a tight ship and, like all their events, the Moto Swap is well organized and goes off without a hitch. Here are some highlight shots from the last one! If you can fit it in, come out and show your support for Lowbrow’s efforts. I will be there for sure with the Old Bike Barn crew, some scratch and dent, and assorted goods. See you in February! Until then, keep it between the ditches and the shiny side up! Looks like it was a great swap meet. Where is this event held?? Medina Ohio there were venders out side as well but it rained all day.